After an exciting day exploring Buenos Aires by bike on the Saturday (which you can read about here), C and I decided to wind it down a notch, and have a wonderfully relaxed Sunday. Buenos Aires is famous for their weekend markets – the most popular being in San Telmo and Recoleta. However, C and I had heard of another Sunday market that had caught our attention, and that was the Feira de Mataderos. 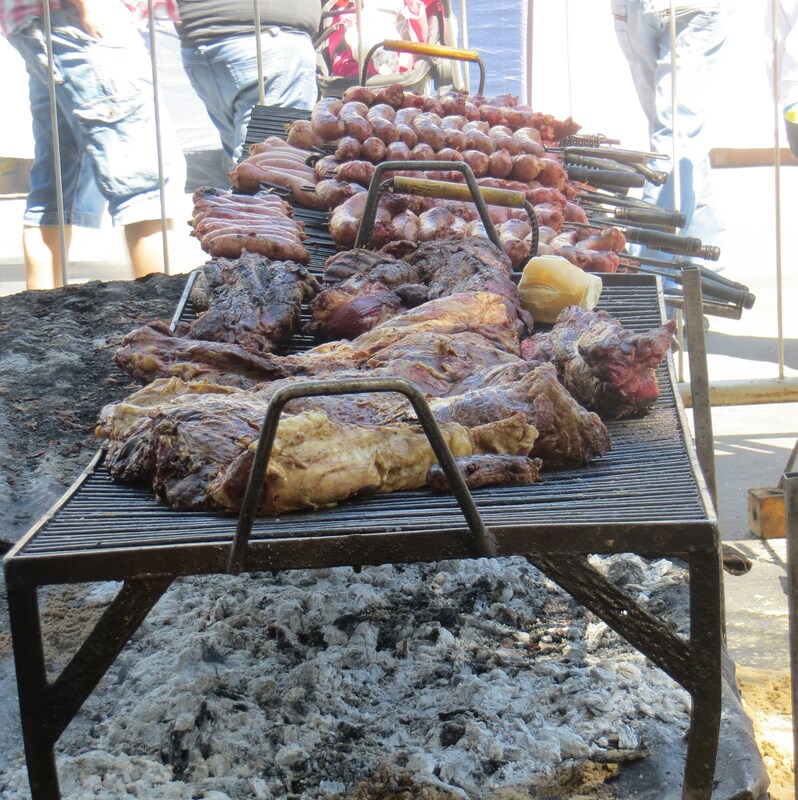 Situated off the normal tourist route, the Feira de Mataderos showcases all things ‘gaucho’. What is gaucho I hear you ask? Well, put simply gauchos are the equivalent of the North American cowboys. Here, every Sunday at the Feira de Mataderos, you can see on display the gaucho traditions, music, dance, crafts – and most importantly to me – food! The fair is located in the neighbourhood of Mataderos in the far east of the city, it is a 25 minute taxi ride from where we were staying (near Porto Madero). The neighbourhood itself is steeped in gaucho history as it was once the hub of rural commerce, boasting a large livestock market and numerous slaughterhouses – which is where its name comes from – Mataderos in Spanish, means slaughterhouses. The fair is spread over 3 streets in Mataderos, with over 300 stalls – all channelling you into the centre where a big stage has been erected. The stalls sell everything from leather to silver to books, to wood works to hats – everything a good gaucho may need! There were also numerous stalls selling traditional Pampas food products such as, honey, cured meats , fresh bread, cheese and lots of other little delectable’s. Although we didn’t do it, this would have been the perfect place to put together a pick nick basket! The atmosphere is jovial and bustling. Live folk music is playing in the background, and people are spontaneously dancing in front of the stage. Some have even donned their traditional gaucho outfits. However, not once did this feel like a staged event put on for the benefit of tourists. In fact, we saw very few tourists during our time there; on the contrary it was gaucho enthusiasts celebrating their proud pampas roots and keeping their traditions alive. Now, let’s talk about the food! Naturally this was the most exciting part of the day for C and myself :) Make sure you come hungry, and even if you are not hungry, the smell of the parilla wafting through the air will definitely make your tummy rumble. I started the morning with a little snack – the best empanada I have had to date (I have become an empanada fanatic since moving to Latin America!). Freshly made, deep fried before my eyes, and served piping hot – I was in heaven! There are also numerous of food stalls located behind the main stage, specialising in a whole array of Argentine specialities; humitas, tamales, torta frita, locra, grilled meats and many more. However you have to be patient – the cues are long! 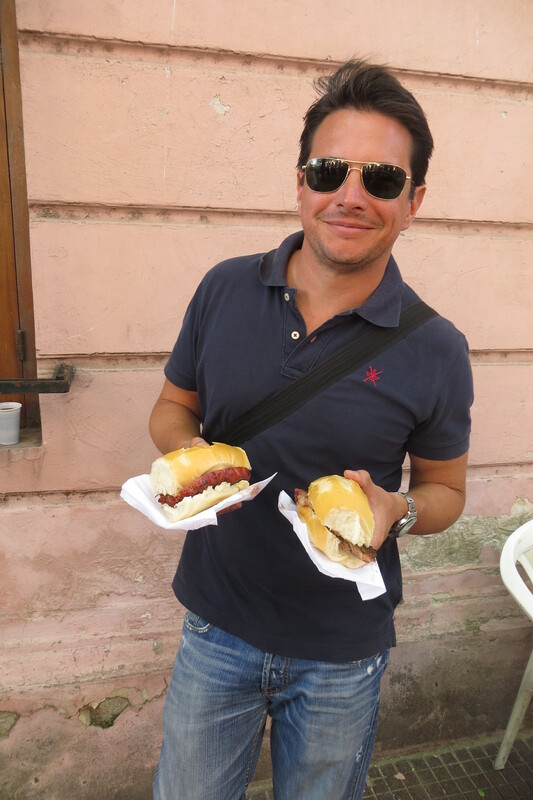 Once you have decided what you are going to eat – I highly recommend a traditional Argentinean grilled meat sandwhich washed down with a sweet red wine served in plastic cups -find yourself a little spot, sit back and enjoy the atmosphere! Travel with Pen and Palate. So, if you find yourself in Buenos Aires on a Sunday and looking for a vibrant activity to just soak up the atmosphere, make your way down to Feira de Mataderos. < Previous The Ultimate Brownie Recipe! I love Buenos Aires! I only got to spend a fortnight there, but it was enough to get a taste of an amazing, colourful city! I enjoy reading and viewing your travels, also await more recipes. Life sounds good. Continue to enjoy.